I don’t tend to enjoy games that are artsy for the sake of being artsy. I’ve played a few of those. You know the type. “Games” that go out of their way to be “art”. As much as I support the “games as art” argument, I don’t feel games should try to be art, just being art is enough. I’ll admit, as I sat down in front of my television, DualShock 3 in hand, I was prepared to hate Journey. I’d heard conflicting reports on forums from people who had played the game. Some called it one of the best gaming experiences they’d ever had while others derided it for being only about two hours (which it is) and the equivalent of “push forward to win – the game”. I thought I would fall into the second camp. But once I loaded the game, I kept repeating to myself, “Have an open mind”. This is not a game that’s artsy for the sake of being artsy. It’s nowhere near that shallow. 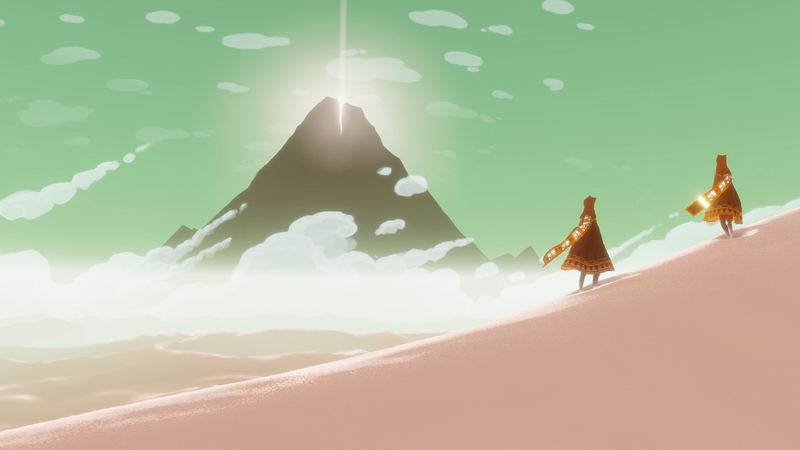 What Journey is is one of the best arguments the “games are art” crowd can put forth. 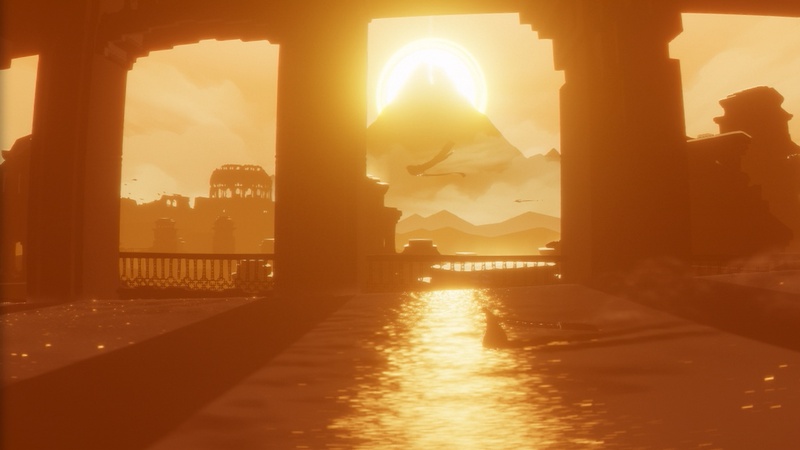 Journey is a fantastic game that isn’t much of a game at all. It’s more than that. This is an elegantly crafted, finely honed masterpiece of a game that stands out (in my mind, at least) as one of the most unique and memorable experiences I’ve ever had with a game. Perhaps I’m overdoing it with the superlatives but that’s a side effect of a game as thoroughly unique as this one. 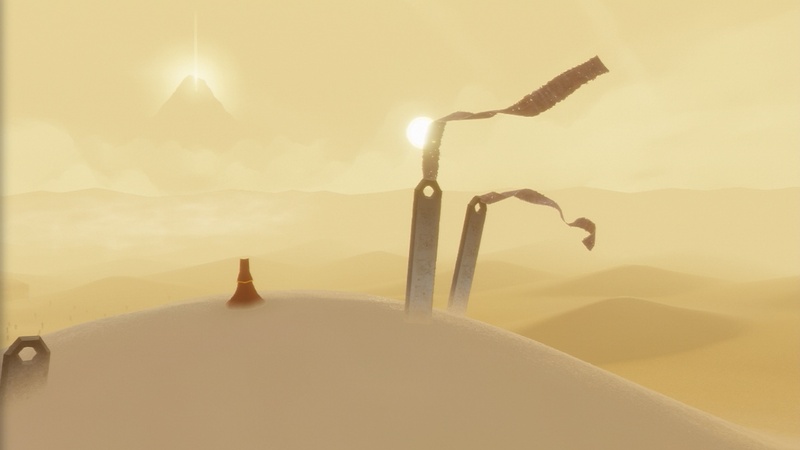 It’s exceedingly difficult to describe Journey in a way that properly conveys its brilliance. Oops, I did it again. I told you it was difficult. But let’s be honest here. Journey is only 2 hours long. Maybe three if you’re really pushing it. That’s probably why it made such an impression on me. It doesn’t drag anywhere near as often as many games much, much longer tend to do. It’s like a good, well-paced movie. If it’s worth its salt, you shouldn’t notice that you’re sitting there as long as you have been. That’s how I felt after playing Journey. I looked over at the clock and sure enough, I’d finished the game in just under 2 hours. And during that time, I experienced a wealth of emotions. Elation at my triumphs, wonder at the beauty of the lovingly rendered scenery and…sadness. Not a single word is seen anywhere in the game. Not a single line of dialogue is exchanged. Hell, the protagonist doesn’t even have facial expressions. Yet, by the end, I was nearly moved to tears. Not quite there, but almost. Even thinking back to it now is bringing back some of those mixed emotions. I cared about the protagonist, the nameless, faceless wanderer who journeys through the desert. In less than two hours, I’d actually grown to care about a creation of pixels and strings of code, a creation of pixels and strings of code who never utters a word. Journey does have an intriguing and original co-op mechanic that is unlike any other game I’ve played and works incredibly well in practice. Players are unable to communicate (you won’t even be able to tell who you’re playing with until the end) but it works extraordinarily well. Coming back to this review after a few days, now that the adrenaline and endorphins have equaled out inside my body, I realize something about Journey. Though it’s undeniably a game, it’s somehow more than that. Okay, maybe not more but something different. It’s not a game that will win you over with amazing gameplay; rather, it’s the experience that’s most important and makes this game so unique among its peers. That’s why I’m not going to judge it as a game. If I did, I’d have to be quite harsh on it. It’s a two hour game with limited gameplay, and is perhaps too simple for its own good. As far as I can tell, it’s impossible to “lose” in this game, which allows for pretty much everyone to take part in the experience itself but some gamers are likely to be put off. Not to mention, it’s expensive. $20 for a two hour game is quite a lot to ask, even if it does come with decent replay value. At half the price, it would be easier to recommend objectively, even if I do think it’s worth it. The experience of playing this game is worth the cost of admission. I’d even go as far to say that I can forgive the shallow gameplay and brevity because everything comes together to make an experience that’s more than worth the cost of admission. The stellar visuals, simple but still fun gameplay, well realized co-op and a fantastic soundtrack coalesce into one of the most unique and rewarding experiences of this generation. 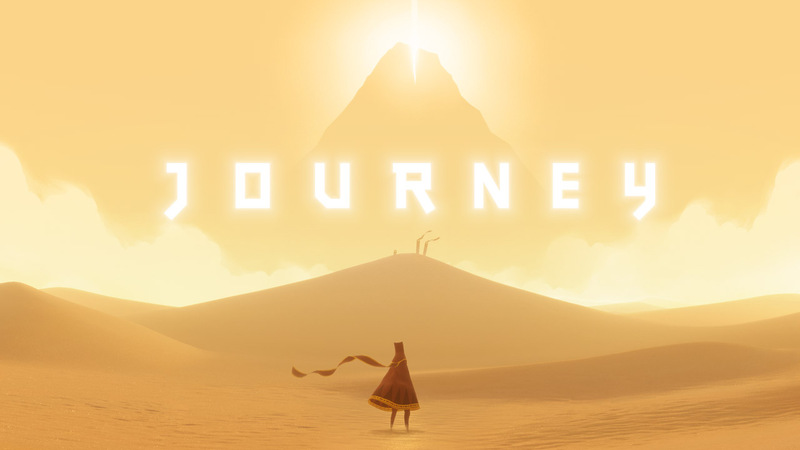 Journey is definitely short but it being much longer would probably have dulled the experience. But don’t trust my pretentious hyperbole and give it a try for yourself. Love it or your money back! Okay not really, but seriously, give Journey a shot.